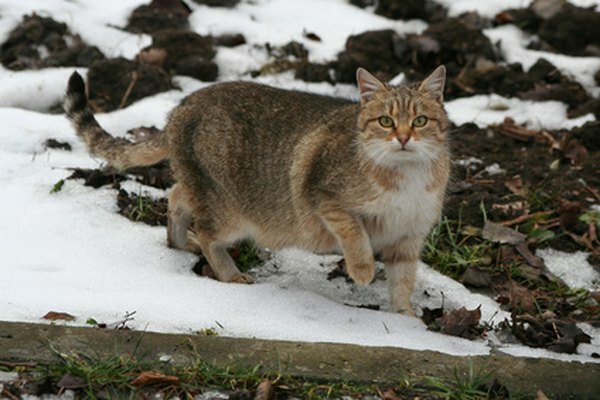 Outdoor kitties can catch a cold from other cats they encounter. Notice that your cat has been sneezing a lot lately? This could mean that he has a virus or bacterial infection. There are several causes for frequent sneezing in cats, some serious, so the best course of action is to get a proper diagnosis and treatment plan from your vet. Cats sneeze regularly, just like humans, to discharge matter from their noses that causes irritation of the mucous membrane. Although a sneeze every now and again is perfectly normal, frequent sneezing, especially with runny discharge, is not. A sick cat will paw at his nose, have discharge from both the eyes and nose, appear lethargic and may develop a lack of appetite, according to PetPlace. If a cat can't smell his food because of a stuffy nose, he may not want to eat, which can cause more serious medical problems. At the first sign of frequent sneezing, it's time to visit the veterinarian for a proper diagnosis. The most common causes of sneezing and upper respiratory infections in cats are the feline herpes virus and calicivirus, according to the American Society for the Prevention of Cruelty to Animals. This virus is passed from cat to cat via direct contact through mutual grooming, the sharing of food and water or through the airborne mucous expelled by a sneeze of an infected cat. Brachycephalic or flat-faced breeds of cats, such as Persians or Himalayans, are more prone to the herpes virus than other types of cats. A more serious type of virus, the feline immunodeficiency virus, also can cause sneezing in cats. This virus is common in outdoor cats and is transmitted by deep bite wounds that occur during fights. The disease has no cure and can compromise your cat's immune system. Either of these conditions needs to be diagnosed and treated by a veterinarian. Seasonal or food allergies can sometimes be the cause of frequent sneezing in cats. Pollen and other environmental allergens irritate your cat's nose and cause him to sneeze, usually accompanied by wheezing, according to Cat Channel. Antihistamines are used to treat allergies in cats and alleviate symptoms; steroids can also help reduce inflammation. To deal with allergies, your veterinarian may place your cat on a hypoallergenic diet, which consists of a few ingredients such as potato, rabbit and duck. These unusual proteins are less likely to cause allergy symptoms. If your cat reacts well to the diet, ingredients are slowly added back in to determine which one is causing the allergic reaction so you can avoid it. Foreign matter in the nose, such as the inhaled seed of a foxtail plant, can cause frequent sneezing in your cat, according to PetPlace. A tumor in the nostrils or dental disease also can be the cause of your cat's sneezes. Upper respiratory infections are usually caused by a viral infection but also can be caused by bacteria. The bacteria, typically chlamydia or bordetella in cats, are highly contagious and can be transmitted through physical contact or shared food and water dishes, according to the ASPCA. To treat a bacterial infection, your veterinarian will prescribe antibiotics. Left untreated, an upper respiratory infection can develop into pneumonia, a life-threatening illness. Isolate your cat to prevent him from infecting any other cats in your home until he shows no more symptoms of illness. While there is no cure for a virus, you can alleviate the symptoms by administering a feline L-Lysine supplement to your cat. L-Lysine is an amino acid that helps to slow the spread of the virus in the body and speeds up the healing process, according to VetInfo. Provide your cat with a humidifier to keep the air around him moist and give him some relief from congestion. Reduce stress as much as possible, because stress can worsen your cat's symptoms or even bring on an attack of the virus that causes sneezing. In serious cases, your cat may need to spend the night at the vet's to receive intravenous fluids, nutrition and medication. Some medical conditions that cause frequent sneezing in cats can be prevented by a vaccine. The FVRCP vaccine is available to prevent most strains of feline herpes or minimize the effects of the disease. A vaccine is also available for FIV. Speak with your veterinarian about these vaccines, especially in multiple cat homes. Isolate a newly adopted cat or kitten for a few weeks before exposing them to your existing cat, in case your new furbaby carries a virus or bacteria. Cat Channel: Why is My Cat Sneezing? Can Kittens Have a Cold With Coughing & Sneezing?